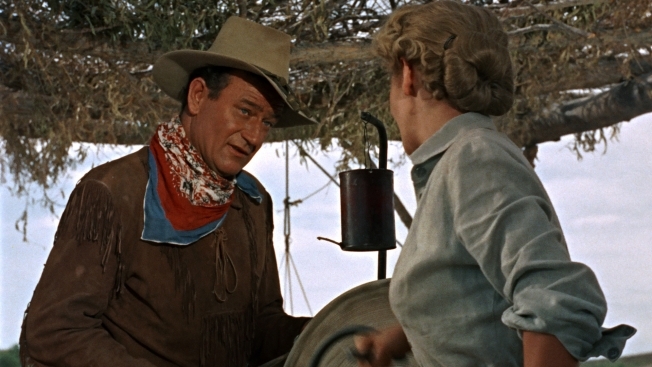 John Wayne cuts a classic cowboy figure in 1953's "Hondo," one of his most beloved films. It’s a good time to be a John Wayne fan. One of the most iconic and prolific actors in the history of Hollywood, with an image that defined rugged, just-minded American manhood, Wayne’s cinematic legacy still remains vibrant on home video. Unparalleled classics like “Stagecoach,” “The Searchers” and “True Grit” have never seen their Western vistas that look more gorgeous than on Blu-ray. The latest treasure to emerge is the much beloved “Hondo,” the 1953 adaptation of a Louis L’Amour story that was originally produced for theaters – by Wayne himself – in 3D. A Western of particular sensitivity as well a tale that’s action-packed, “Hondo” features Wayne at his most stolid and charming, at the height of his physical prowess and coming into his fullest as Hollywood’s ultimate cowboy hero. And the shots designed to showcase the 3D process are handled with remarkable restraint, never intruding into the action. PopcornBiz spoke with Gretchen Wayne, the late actor’s daughter-in-law and the current steward of his film properties, following in the footsteps of her late husband Michael, for the inside story on Wayne put together one of his most beloved movies. Where did 'Hondo' fit in John Wayne’s estimation, among the rest of his substantial body of work? He liked 'Hondo' a lot. He thought that in 1952-53, that era, that he was at his best. He looked his best, cinematic-wise, on the screen. He was still slim and he looked great. You had 'The Searchers' at the same time. You have a host of pictures like 'The Quiet Man.' He loved that look, and he felt that 'Hondo' was right up there as one of the best westerns he'd made – and it was unique because it was made in 3D. Do you have a sense of how he felt about experimenting with 3D? The technology was going though a boom time, similar to what's going on now. Yeah, It was a little more crude than it is now. Back in the '50's it was choreographed in a manner that if it was 'Bwana Devil,' the lance was coming out at you, in 'House of Wax' you felt the heat of the flames licking out from the screen. So 'Hondo,' while choreographed in a similar manner, didn't employ so many of those techniques where the knives are out at you. Why was JimmyGrant The Duke's go-to guy when it came to his screenplays? He had a way with the phrase. He absolutely could put words into my father-in-law’s mouth that sounded exactly the way that granddaddy would say them. There's a brevity to his dialog. You don't have long paragraphs of dialog with Jimmy and it's very pertinent, what he has to say. In the scene in 'Hondo,' when he and the girl are standing there at the beginning of the film and they're talking about Indians, he says, 'Why I could smell you in the dark, Mrs. Lowe, and I'm only PART Indian.' He goes on to tell her that she baked bread and took a bath, something like that. That’s very unusual dialog and we get the point. You don't have to be hit over the head with it. What are the standards and the guidelines that you use when you're going into the vault to put out one of the classic John Wayne films? I was married to Michael for 45 years, and so I try to remember, I go back into notes and things – my husband was a great one for keeping everything – to see what my husband's vision was for things. He was great. Michael was a great one for discussing things at home and so he would tell me what he thought or who he wanted to work with or who could restore this or who could do a good job. I remembered all of that, and while it's a daunting responsibility, I had an outline, if you will, because my husband had restored it for VHS, so I kind of knew the pattern that he followed and I simply put my feet into his footsteps and went forward. What do you think was the connective tissue between the kinds of movies that John Wayne liked to make, films from 'True Grit' to 'The High and the Mighty' to 'The Alamo'? I think a lot of it is that he had a great sense of history. When we were all over in England when they made 'Brannigan,' it was a great experience. What was very important to him was that during the daytime was that I take all five of the kids and go out to visit Chartwell, which was [Winston] Churchill's country home. He loved Churchill. And he felt like we should get to every museum we could get, get to see everything that you could, because he loved all of the history. He thought that was important, that we learned from history – because not a lot that was new happens every day. It all harks back to the time before us. I think he thought that was terribly important. Do you think that lent itself to the timelessness of so many of his films? I think there's an honesty. There are certain things that are true, no matter if it's the middle ages or today or if something is set in the future. People still get hurt. They still fall in love. They miss the connection with their families if they have to travel. I think in all of that you still have anger and hatred, and somebody is always going to be the villain and something is going to upset the applecart. I think those are unique things and there are only so many things in storytelling anyway. Man against man. Man against nature. Man against whatever the common enemy happens to be, whether it's wolves coming to your door or someone flying over in an airplane and dropping bombs. Now that we have this fantastic Blu-ray format, is there a film that you're anxious to see released in that format that you haven't released yet? What I'd like to see done is 'McClintock!' because there's a lot of really beautiful scenery, and if we could open that up so that you could really appreciate it, I think that'd be great. The other one I'd really like to do is 'The High and the Mighty.' It was a challenge [to create the DVD] because we were missing three reels of film. My husband, the dutiful steward that he was of his films, had made separation masters, so we could recombine those separation masters for those three reels that were missing and then correct them digitally and insert them into the film. So 'The High and the Mighty' is kind of a hybrid, if you will, between film and digital restoration. What's your favorite John Wayne film, and what was Michael's favorite?